The mechanical action of the machine delivers the liquids in the HOST® Sponges to the dirty fibre surface. 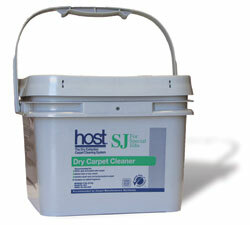 The HOST® Machine brushes the HOST® SPONGES Cleaner up, down, over and around the dirty carpet fibres. The SPONGES Cleaner contacts all surfaces of the dirty carpet fibres, dissolving and absorbing the oil bond and sticky residues that causes dirt to adhere to the fibres. The HOST® Freestyle ExtractorVAC delivers the same award winning cleaning capabilities as the Liberator and adds flexibility with the removable vacuum pod and detachable cleaning brush unit. This is ideal for cleaning smaller areas, carpeted stairs, under desks, tables and work stations. The added flexibility is perfect for residential cleaning, hotel guestrooms, offices and works with the Liberator for use in more confined areas in commercial facilities. Dispense HOST® extractorSPONGES® quickly and easily with the HOST® Applicator. The HOST® Applicator features three “Smart Settings” for light, medium and heavy soil that accurately controls product dispensing and cost. The HOST® Applicator is highly manoeuvrable, making it ideal for both commercial and residential use. 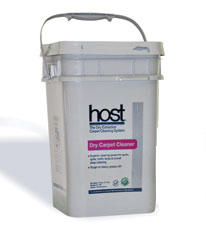 HOST® Dry Cleaner delivers a deep clean by dissolving and absorbing dirt. The process uses HOST® extractorSPONGES® which are a soft, natural and moistened with a small amount of water and cleaning products to deliver a formula that deep cleans carpet, track-off mats, grouted tile, LVT and any other textured hard floors. The cleaning formula is safe, nontoxic and biodegradable. Available in 14kg buckets. Specially formulated extractorSPONGES® for commercial carpets, carpet tiles and more extreme dirt removal, including asphalt, or on solution dyed nylon, polypropylene, SmartStrand® & Triexta® carpets, white or off-white wool, Berber and light-coloured carpets. Not recommended for use on grouted or rough textured hard floors. Available in 5kg buckets, 4 per case. Suitable for routine spot removal and small area cleaning as well as the perfect refill for HOST® Carpet Spot Removal Kit. Available in 1kg bag, 12 per case. 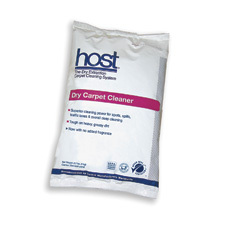 Recommended for extremely soiled carpet and specially formulated to be used with HOST® extractorSPONGES®. 4L of concentrate makes 19L of ready-to-use solution. 15L per case. For use with HOST® extractorSPONGES® on high traffic areas, tough spots and greasy, oily dirt. Available in 222ml spray bottle, 12 per case. 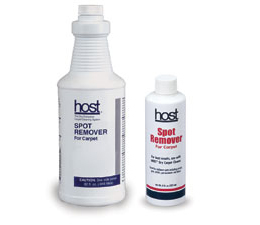 Great, all-around spot remover when used with HOST® extractorSPONGES®. The special emulsion removes grease, oil and water-based spots. Excellent for gum, tar and hardened food spots. Available in 0.946L and 0.236L bottles. 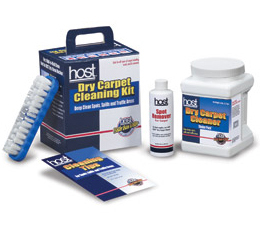 For the professional cleaner or in-house staff, the HOST® Carpet Spot Removal Kit is everything you need for cleaning spots and spills quickly. Kit contains: 2 x 1kg bags of HOST® Dry Carpet Cleaner, 1 x 237ml bottle of spot remover, 1 x 207ml spray bottle of Pre-Clean, a white towel and a HOST® Spotting Brush. Everything you need to deep clean spots, spills and high-traffic areas quickly and conveniently. The enclosed hand brush can also be attached to a handle for easy, stand-up cleaning. Kit contains: 1kg HOST® Dry Carpet Cleaner Shaker Pack™, 237ml HOST® Spot Remover, HOST® Carpet Brush (fits any standard threaded handle for easy stand-up cleaning) and a HOST® Cleaning Tips Booklet. Rid the carpet and household areas of bad smells permanently by absorbing odour molecules instead of just masking them. 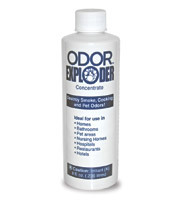 Ideal for bathrooms, pet areas, garbage disposals and all odour-prone problem. Available in 237ml bottle of concentrate that makes more than 4L of solution.